1.Please check the appearance of the iPhone 8 Plus 5.5" LCD Screen carefully when receive it to confirm whether there is appearance breakage. Any problems, Please do not hesitate to contact us and provide photos for the problem. 2.Please make sure you are a special repair technician, because it is not an easy job to repair the screen (especial the flex ribbon is easy fracture), please test the item firstly before installing it, just by plugging the flex cable to your mainboard, we will not be responsible for any faulty or damaged after the assembly. 3.There are different sizes and length screws when you replace your iPhone LCD Assembly, please remark each screw and put them in the original place. Otherwise the screen will be easy broken if you put the screw in the wrong place. Used to repair faulty LCD display and touch screen digitizer Complete LCD assembly for iPhone 8 Plus 5.5"
If you have any questions about this product by JC Mobile Parts, contact us by completing and submitting the form below. If you are looking for a specif part number, please include it with your message. 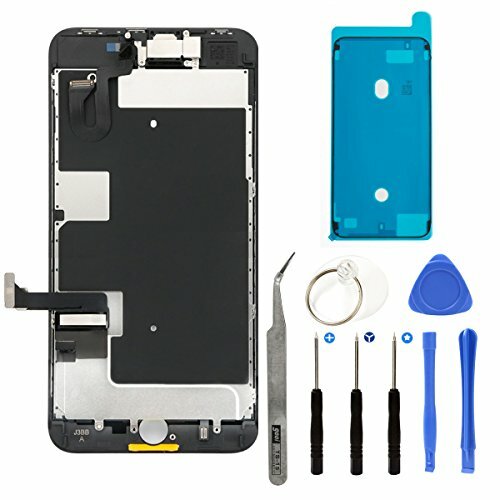 Nroech LCD Screen Replacement for iPhone 6 (Black) with Home Button, Full Assembly with Front Camera, Ear Speaker and Light/Proximity sensor, Repair Tools and Free Screen Protector Included.